With the recent rally gold is now at all time high with prices RS 19169 per 10g. Is this price justifiable? This is a question asked by people ranging from investors to country heads. Here we are listing the top 5 reasons which we think , why you should not invest in gold now. 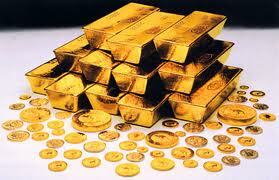 We all know's country's accumulate gold. But surprisingly 7th largest gold holder in the world is not a country but an Exchange Traded Fund (ETF) named SPDR Gold Shares (GLD). So if some huge investors in these funds decide to dump their shares or liquidate it, who will buy these tons of gold? This surplus supply can cause the gold prices to crash. Gold price rise is not because people buy more jewelry. It's because people fear hyper inflation and value loss of paper money. Because of this experts says buying gold is a 'fear trade'. Few days back NBER said US recession ended in june 2009. So as economy recover and people become less 'fear' , there is a good chance that gold prices will ease. Even though the recent run up of the gold will make us think , to consider gold as a perfect thing for long term investment. But the truth is different. Golds last high was in 1980, where it was around 850 RS per gram, which has now reached 1915 RS. This is not a good growth if you adjust it for inflation during this time. 4. If the bulls are back - Gold will be in trouble. Historically the price movement's of gold is very well linked to the equity market. When the markets are on an upward momentum people and enterprises will move their Gold investments to equity to fetch better return. And when the market is under the Bear grip / down turn people will take back the money from equity market and put it in gold. So even though Indian markets are on a rise now, the global markets are yet to move out of the down turn. So once the global indices is moving up , the investments n gold may get moved to equity, which will lead to a heavy correction. Gold has spiked a lot in the recent months. And no one can point out any fundamental reason for it. Neither it's because of the changes in economy , nor the market, nor the natural demand. And it's suspicious enough to doubt some one having a hand behind this.